For Blender 2.8 the Info Editor, the area that previously ran across the very top of the application, has been removed and contents reorganised to emphasise various context sensitive Workspace tabs and application menu options. Missing from the redesigned upper area of Blender 2.8 is the Scene Information section that displayed data relating to objects being edited (Edit Mode) or the contents of a Scene (Object Mode). This data is now shown to the right side of the new Status Bar that runs along the bottom of the application. Design note: the Info Editor itself was largely an empty area except for the Header which held scene information and various application menus that, although no longer shown within a distinct area, are still available, largely reorganised to make better contextual sense in relation to prioritising Workspace tabs. 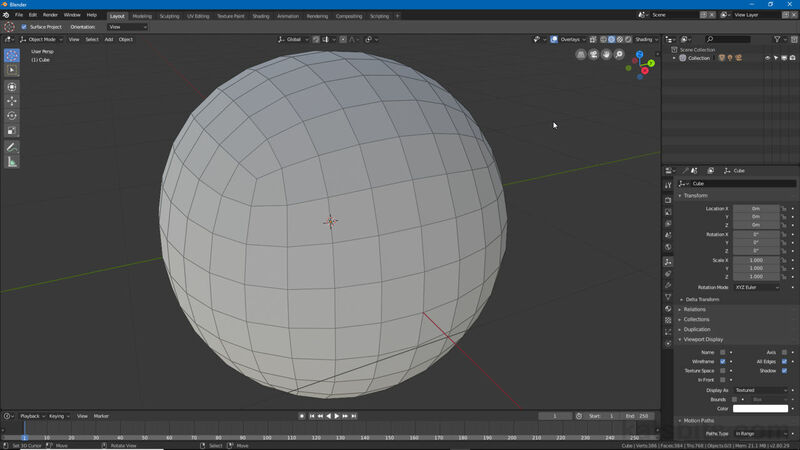 The information about a scene or selected object that used to be displayed in the Info Editor that ran across the top of Blender has been moved to the right of the Status Bar. Scene Information changes depending on the active Interaction Mode; in Edit Mode the data shown will related to the number of faces the object might have versus the number selected whereas in Object Mode will display similar information but relating to all objects in a given Scene.